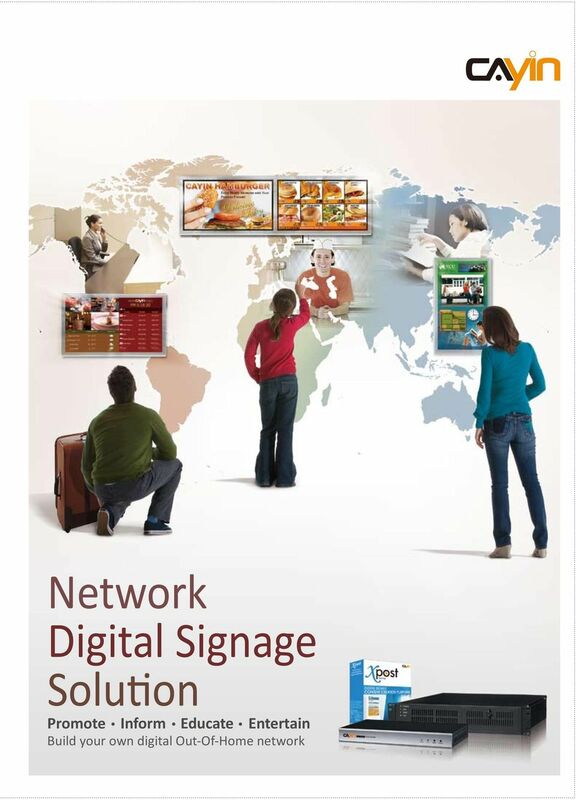 Download "SMP-WEB3 / SMP-WEB3N Digital Signage Media Player"
3 Main Features of CAYIN s Solution Powerful Remote Management for Small to Large-scale DOOH Network The uniqueness of CAYIN network digital signage solution lies in its powerful remote management and scalable products which can collaborate with each other to compose versatile combinations corresponded to the requirements of each project. Basic Level Each SMP player can be managed individually by its web-based user interface via network. Configuring multimedia contents playback Changing system settings of each player Updating contents by FTP and Network Neighborhood Medium Level Administrators can divide a large amount of players in different groups and control all of them centrally via CMS server on its web-based user interface. 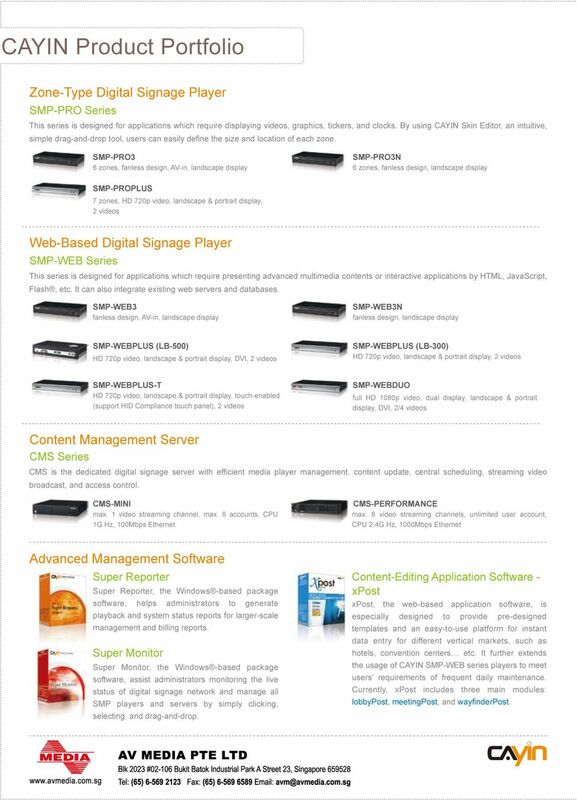 Content update and synchronization Playlist central scheduling Access control of multiple accounts Live streaming video Advanced Level Multiple CMS servers or digital signage networks can be monitored on one PC by Super Monitor. Reports can also be generated via Super Reporter. Monitor live playback and content updating status Alert mechanism for abnormal status Generate detailed playback lists and statistics per project PLAYER SERVER ADVANCED MANAGEMENT SOFTWARE Emergency Mode Once you come across an emergent event, the public sign can be switched to play the pre-set emergency messages immediately. The emergency mode has the highest priority and can be triggered by either CMS or Super Monitor. 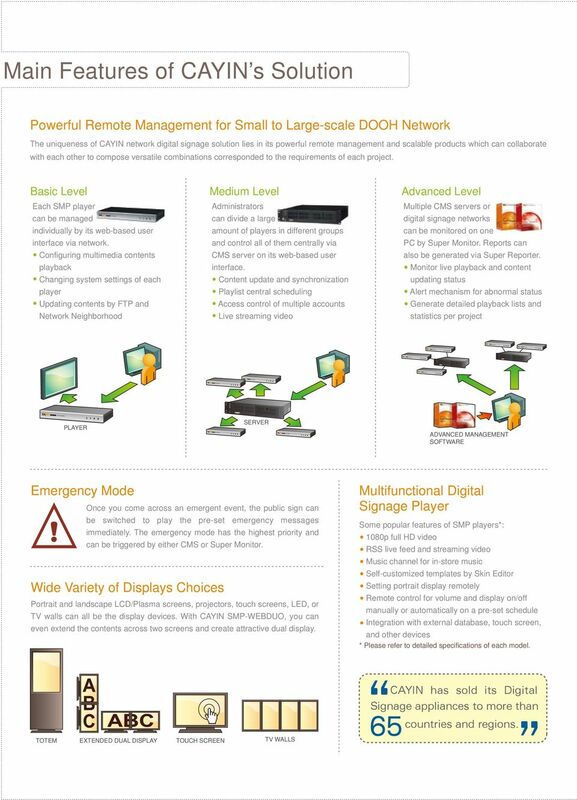 Wide Variety of Displays Choices Portrait and landscape LCD/Plasma screens, projectors, touch screens, LED, or TV walls can all be the display devices. 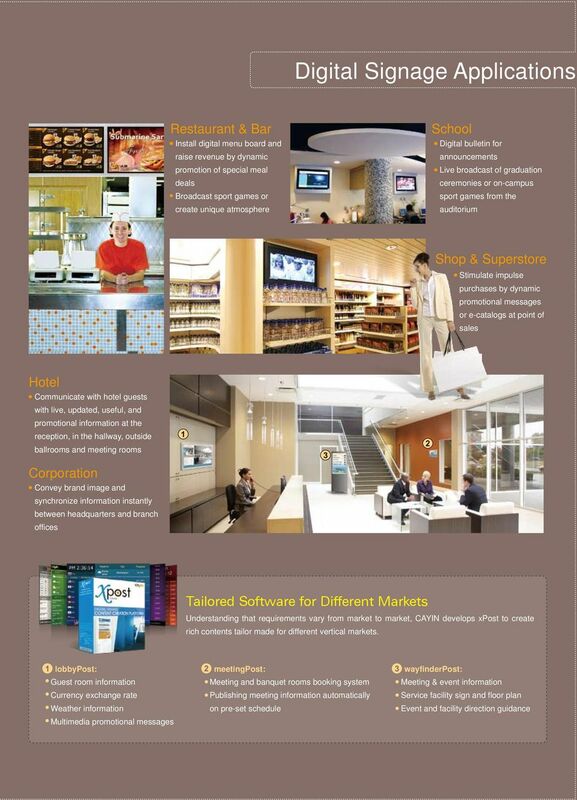 With CAYIN SMP-WEBDUO, you can even extend the contents across two screens and create attractive dual display. 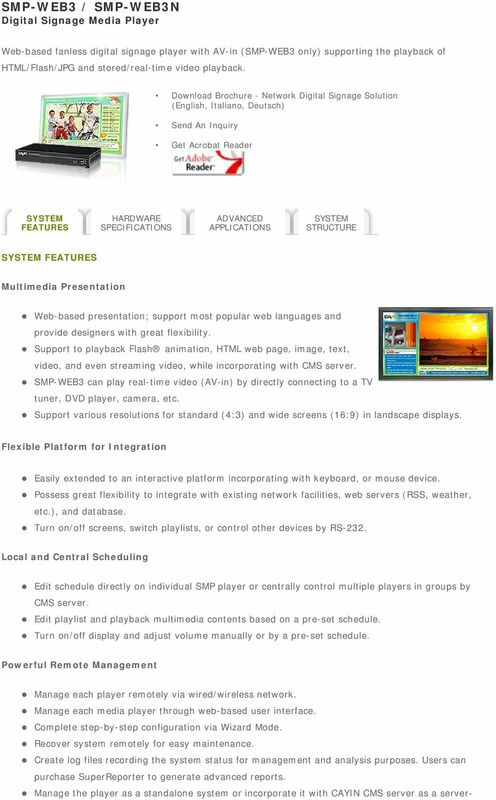 Multifunctional Digital Signage Player Some popular features of SMP players*: 1080p full HD video RSS live feed and streaming video Music channel for in-store music Self-customized templates by Skin Editor Setting portrait display remotely Remote control for volume and display on/off manually or automatically on a pre-set schedule Integration with external database, touch screen, and other devices * Please refer to detailed specifications of each model. TOTEM EXTENDED DUAL DISPLAY TOUCH SCREEN TV WALLS Signage appliances to more than 65 CAYIN has sold its Digital countries and regions. Announcement, Call Processing and Music/Messaging-On-Hold System Solutions For Any Industry The XMU+ is Interalia s next generation advanced announcement, call processing and music/messaging-on-hold system.